Following from my last post about my crazy shopping from Forever 21, I went back there again this week and did some MORE shopping! XD I'm going on a shopping spree-frenzy this month. There is still one more item that I want to get from Forever 21 but they didn't have my size when I went. I'm planning on going back to the store again later on this week to find it and that will hopefully be the end of my shopping for the fall until winter, lol! Super cute and adorable hearts print pink sweater. I am so IN LOVE with this sweater. It was like love at first sight. This item wasn't on sale but I just had to get it because it's so cute and I need to get it soon while small sizes are still in stock and before it gets sold out because new fall items are getting sold out crazy fast at Forever 21! A really cute and sweet looking polkdots pink tulle skirt. This skirt actually has 3 different layers in it. It looks super cute in person! Bought this at regular price for $18! A simple black pleated rock style skirt. I love this skirt! It's a great simple essential piece to match sweaters and leggings with for creating a dark but yet cute looking outfits for the fall. Can't wait to wear and rock this skirt out, haha! White biker style jacket from Urban Behaviour. 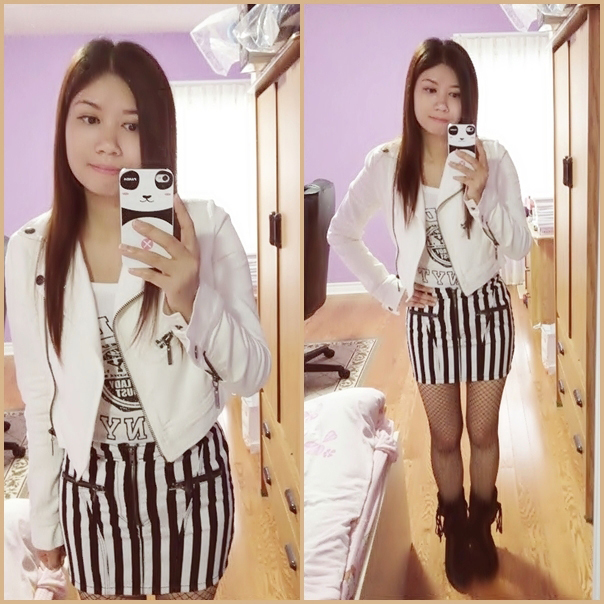 Black and white stripped zipper pockets skirt from H&M. Fish net stockings/tights from Ardene. Black tie-strings boots from Spring. White long sleeve graphic top from YesStyle. 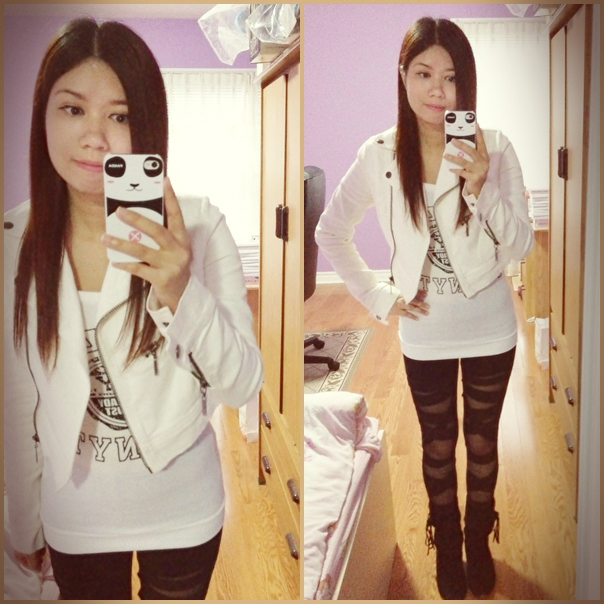 Cross bandage leggings from YesStyle.